"People are going to notice Bryan Singer now." That seemed to be the consensus as we came out of the theater. Not that people haven't already noticed Singer, a young Jewish, gay director who burst onto the scene with his second movie, the cult favorite "The Usual Suspects," quickly followed up with the Nazi-themed indie, "Apt Pupil." Those two films certainly got him noticed by someone big in Hollywood, who tapped Singer to launch the X-Men franchise and basically his ticket to whatever else he wanted to do since then. He seemed to not want to finish the X-Men trilogy, instead choosing to launch a rather lackluster reboot of Superman. Those who were disappointed by Singer's last effort should be reassured that he's returned to a subject, storyline, and style that this time delivers the goods. "Valkyrie" is a taught, well-directed suspense thriller about the last and most nearly successful plot to kill Hitler, with Tom Cruise giving his usual Big Gun performance as plot leader von Stauffenburg, in a movie that lights the fuse in the first scene and keeps the tension well sprung until the inevitable disastrous end. Singer knows best how to tell stories about a group of outsiders banding together to fight clearly defined forces of good and evil. The Usual Suspects was the classic crooks-with-a-heart-of-gold fighting-against-the-callous-evil-criminal tail. Which is why he was so suited to the X-Men franchise, another story that required following a band of outsiders with special powers as they plotted together to fight various evils. It doesn't seem then that there could be a more classic story of outsiders battling evil than the plot by some of Hitler's top Generals and Army careerists to overthrow his tottering government in the last days of World War Two. The assembled cast of the disillusioned, including von Stauffenburg, aren't motivated, really, by anything more than the idea that Hitler is giving Germany a bad name around the world - and that German boys are dying unnecessarily in a war of choice that seems doomed to eventually fail. (Sound vaguely familiar?) They are primarily after regime change at home. Killing Hitler, it seems, is just one of the essential cogs in their elaborately plotted coup. In a country, however, where even a casual utterance of displeasure could result in the SS pounding down your door, these plotters must construct an elaborate scheme and carefully cultivate a series of confidants in key places. Surprisingly, plenty in the movie seem more than willing to take up the cause (something we'll get to more of in a minute). Cruise's von Stauffenburg becomes ever more committed to the goal, and at times, the actor seems to be channelling his "Mission Impossible" persona. Fortunately, Singer keeps a strong hand on the film, and knows how to get the performance he wants. Touches like the camera following the spinning Wagner album on the stereo or the flashback to a well-performed farewell by actress Carice van Houton as Mrs. von Stauffenburg are just enough self-indulgence to give us the punctuation necessary to ratchet up the tension even more. The rest of the time, Singer stays focused on the mechanics of the coup, outlined quite ironically in Hitler's own "Valkyrie" order, which allows for take over of the Army reserves during time of betrayal by the SS (clearly, Hitler distrusted the SS to no end, when he should have been thinking a bit more carefully about the overly strained loyalties of his battered Army). While there isn't a moment in Singer's tightly constructed film that doesn't go to waste...and clearly, Singer has finally matured into a director capable of delivering finely crafted adult entertainment...this movie, with its intense and historically fascinating subject matter that could have been Oscar-worthy, is ultimately merely good, not great. More than worthy of your ten bucks and probably, as they say, "the best thriller of the year." But with a cast and subject as delicious as this...call me demanding, but I wanted that little bit more. Perhaps it is unfair, but the movie that I want to compare "Valkyrie" to is "Munich." Both movies (directed by Jewish directors) are about the costs of war, plots, and assassinations. But while Munich meanders and ponders, has moments of visual poetry, and gives us a reluctant hero who changes not only in attitude but in the depths of his soul, Valkyrie asks us only to be thrilled. The assembled group in Valkyrie suffers from what I would call a "bunker mentality," if you pardon my pun. There is very little we see of the world outside the plotters, about how they interact with that world. There is but one character (the charmingly put-upon captain of the reserves, hauled out from his personal time at the gym or the barbers to do the plotters' bidding) who reflects the moral ambiguity that would be the prevalent attitude of the time. What I wanted was more of that character, and others who might cause von Stauffenberg to waiver, or highlight what might have been some of the more mundane aspects of his motives (such as, perhaps, revenge). 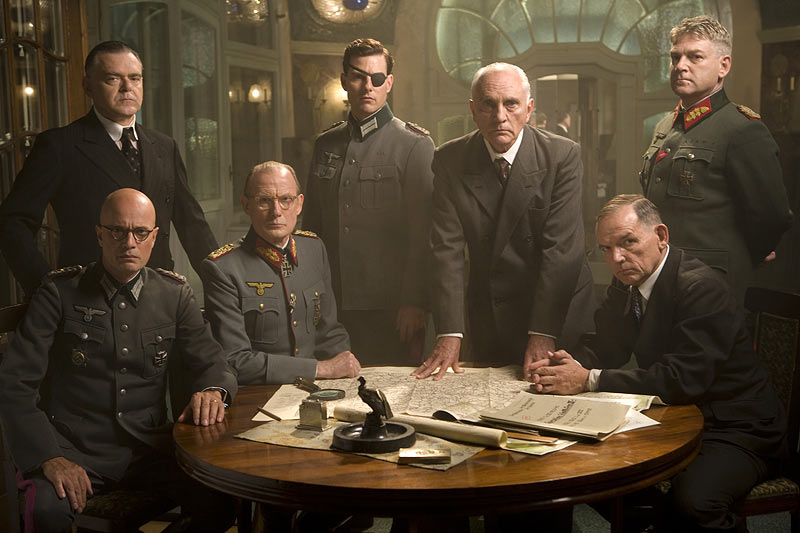 As the movie goes on, von Stauffenberg becomes more commanding, confident, and self-righteous, until we get the ultimately defiant and inevitable "I did it for Germany" declaration at the end. But what I ultimately wanted from Valkyrie and von Stauffenberg was a bit different - more moral ambiguity, not less. A bit of a step back from the bunker and the raising of deeper questions of the kind one gets from "Munich." Valkyrie makes us feels the difficulty of this moment in time quite well, and understand the cost and danger of such an audacious plot. Singer gives us perhaps the best movie yet from a precocious director with a so-far illustrious career. What I was hoping for was not just thrills, however, but perhaps also a sense of understanding...or even, dare I say, a Wagnerian level of poetry. Valkyrie may not be that movie. But with it, I'm confident, one day Singer will really deliver. V for Vendetta? Or Violence?